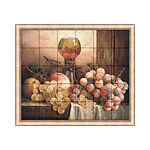 High end tile murals which may be an interesting addition to your cellar. Our selection includes Bacchus, The Danaides and a few others wine related themes. Our murals are a natural complement for a kitchen backsplash, bathroom, shower, foyer, powder room, wine cellar, bar, restaurant or any other interior space. HOW ARE THE MURALS MADE? Artisans create the murals using proprietary technology for hand-printing images on stone. The original art is brought to life on a different medium, suitable for everyday living. This mural collection maintains the integrity of the original painting while adding the dimension and beauty of natural stone. Each marble tile is quarried in Italy and tumbled to reveal its own natural veins and unique character. ARE YOUR MURALS CONSIDERED VALUABLE ART? Yes, they are. Although the artisans were not engaged in painting the original art, they add to it another dimension of depth and longevity by creating it on natural stone. The result is an original masterpiece and authentic representation of the Masters. All the murals are individually crafted; no two murals are exactly the same. HOW DURABLE ARE THE MURALS? In addition to the esthetic value, the murals are very durable and can withstand the conditions of everyday living. The murals arrive pre-sealed and are maintenance free. CAN THE MURALS BE INSTALLED OUTSIDE? We highly recommend installing the murals in interior environment only. Like most paintings, they will last longer if kept away from direct sun and ultraviolet exposure. ARE THE MURALS EASY TO INSTALL? The murals are a perfect Do-It-Yourself project or alternatively, they would be very easy for a local tile setter to set up and install. The factory numbers the selected Mural tiles making installed time less than a couple hours. You will want to test grout color prior to committing, we recommend Polyblend's #122 linen color. Please also see the Installation Instructions. DOES THE MURAL NEED TO BE GROUTED? The only place where grout is mandatory is in a shower application, because of the mold that may grow over time (and yes, it is a perfect product for a shower). It is also quite common to grout for a Kitchen & Wine Cellar. 1/8" joints are provided with your mural and are used optionally. Since the size joint is not large, grout is not overly noticeable. The delivery time, depending on order, is 4-8 weeks. To ensure proper delivery, please place your order as far in advance as possible. CAN YOU CUSTOM SIZE A MURAL? The mural sizes listed are based on the proportions of the original paintings, however, there are additional sizes that can be created to fit your project needs. Please contact us with your request. DO YOU PROVIDE FIELD TILE THAT MATCHES THE MURAL TILES? Yes we do! If you wish to surround the mural with matching field tiles or simply use them in your project, we offer antique tumbled or honed Botticino tiles. Each marble tile is individually treated with the same proprietary aging process, which reveals its veins and unique character. The antique field tiles are offered in the following sizes: 4"x4", 6"x6" and 8"x8". The straight edge honed marble field tiles are offered in Six inch squares only. DO I HAVE TO PURCHASE THE MOLDING WITH THE MURAL? You do not have to purchase the molding with the mural, however it contributes to the look of the mural and brings out its artistic value. Simply put, a mural without a molding is like a picture without a frame. The Travertine Rail molding included in our collection is aged and tumbled to complement the mural. ARE THE MURAL COLORS IDENTICAL TO THE PICTURES PRESENTED IN YOUR CD, CATALOGUE OR WEB SITE? We have tried to present the color and character of the murals as accurately as possible. However, due to the nature of photography and different computer and printing devices, there may be some variation in color and texture between the pictures and actual murals. HOW ARE THE MURALS SHIPPED? The murals are shipped unassembled, along with installation instructions. All murals are carefully packed in corrugated boxes. The art featured in the collection is licensed. Murals are available for shipping within the United States of America (USA) and Canada. Rosehill Wine Cellars offers a variety of wine murals and wine related murals. Distributor is located in Denver, CO, Colorado, United States of America, 90211, USA.